The 2018 Annual Virginia Fly Fishing & Wine Festival has reported record attendance in its 18th year. “It’s hard to believe the festival began in a single tent alongside the South River in Waynesboro,” said festival director Beau Beasley. Thousands of fly anglers from across the country attended the 18th Annual Virginia Fly Fishing & Wine Festival on January 13-14, 2018. Held at Meadow Event Park just 15 miles north of Richmond on the site of the state fairgrounds, the Virginia Fly Fishing & Wine Festival has grown more popular with both new and veteran fly anglers with each passing season. 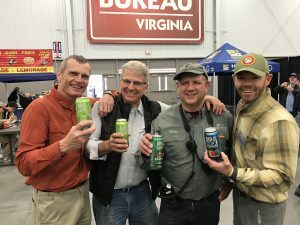 The highlight of the 2018 event was the Festival After-Party, sponsored by Virginia microbrewery Steam Bell Beer Works and Flymen Fishing Company. The short film “Back Bay,” documenting the plight and comeback of one of Virginia’s best-known bass fisheries, premiered at the After-Party. In attendance were author and guide Cory Routh, who provided the movie’s narration, and famed popping bug designer Walt Cary, who is featured in the film and whose knowledge of Back Bay is extensive. After the film, retired Marine and Project Healing Waters program lead Chris Thompson received the “Virginia Fly Angler of the Year” award for his volunteer service and leadership. Beasley insisted that sponsors and volunteers make the event possible. “This festival simply couldn’t happen without the diligence of our hardworking and dedicated volunteers or the generosity of our sponsors–folks at TFO, Green Top, Steam Bell Beer Works, and Harman’s Cabins, among others. The Virginia Fly Fishing & Wine Festival will be held January 12-13, 2019. For more information, visit www.vaflyfishingfestival.org. A sister event, the 2nd annual Texas Fly Fishing & Brew Festival, will take place on March 10-11, 2018, in Plano, Texas (www.txflyfishingfestival.org).